When we drum together, we work as a team ONE beat at a time! Celebrate, inspire and unify your people to the beat of the drum! When you’re looking for team building ideas, African Drumming is probably NOT the first thing that comes to mind! But you might be surprised to learn that Group Drumming has evolved as one of the most popular team building activities of all time! Interactive Drumming is recognised as a cutting edge tool for building teams, and has gained surprising momentum as people realise its limitless applications and benefits, flexibility to resonate with diverse audiences and contexts, and its successful applications in the workplace, community and organisations. And is it any wonder, when 'Drumming together' is simple, fun, accessible, and effective! You can tell a GREAT team by the quality of music they produce! The most successful organisations have one thing in common: a commitment to teamwork. 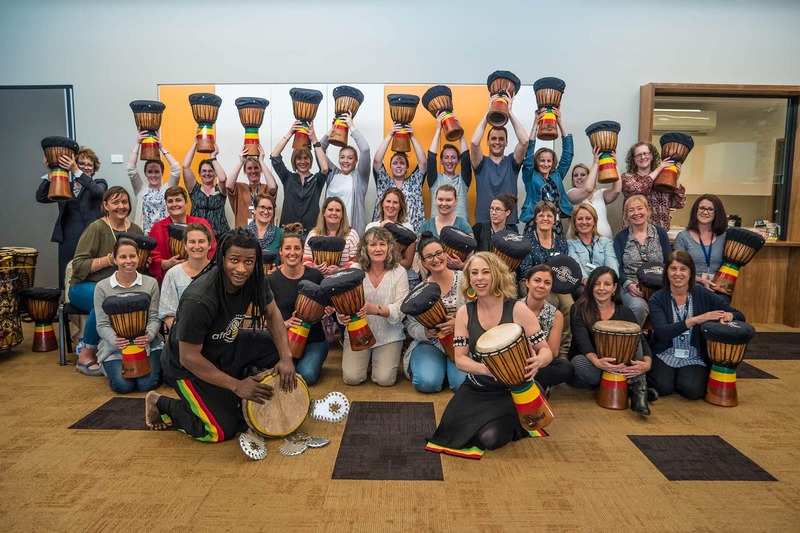 Afrobeat’s Interactive drumming enables teams to learn together, develop team work and create momentum for sustainable organisational change. A natural organiser and energiser, rhythm and music-making provide powerful metaphors for teamwork that result in group synergy, a shared purpose, and a common goal. Because ‘drumming together’ requires the input of ALL team members to produce music, it highlights the interdependence of the team along with the importance of diversity within the team for its success. Inspire your team with an Interactive Drumming experience today!